Astra Garner will become President of Niles, a behavioral health treatment provider for youth in Kansas City, Missouri, effective April 1. Astra Garner, L.P.C., L.C.P.C., R.P.T. has been appointed President of Niles, a subsidiary of KVC Health Systems, effective April 1. Garner was previously Vice President of Program Services at Niles and has been with KVC Health Systems for 7 years. 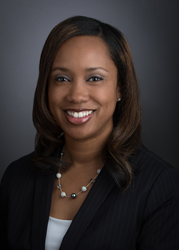 “Astra Garner's extensive clinical background and expertise in mental and behavioral healthcare will help Niles grow and further enrich the lives of the youth and families we serve,” said Jason Hooper, President & CEO of KVC Health Systems. Niles, which has a strong 133-year legacy of providing residential and day treatment behavioral health programs to children and adolescents, joined KVC Health Systems in January 2017. See the partnership announcement here. While its day treatment program is actively serving students and accepting referrals, its residential treatment program paused during the transition period. Renovations to the Niles building are underway and an open house is planned for the spring thanks to several generous donors: The Sunderland Foundation, Community Development Block Grant (CDBG) Neighborhood Stabilization Program, Hall Family Foundation, Gary Dickinson Family Foundation, The H&R Block Foundation, UMB Trust, Sprint Foundation, The Curry Foundation, and the Dunn Family Foundation. Current Niles President Rita Holmes-Bobo will be transitioning full time to her new role as Executive Vice President of Diversity, Equity and Inclusion at KVC Health Systems. Read more here. A lifelong Jackson County resident, Astra Garner, L.P.C., L.C.P.C., R.P.T. graduated from Lincoln College Preparatory Academy located near Niles. She began her career with KVC Health Systems in 2009 as a therapist, helping youth in acute inpatient and residential settings. In 2014, she was selected to be Director of Clinical Services and Community Outreach at KVC Prairie Ridge Hospital in Kansas City, Kansas where she oversaw treatment implementation, interventions, program evaluations, and consultations. In 2016, Astra was promoted to Vice President of Program Services for Niles, helping to ensure performance standards, developing program direction and elevating therapeutic care. Garner was critical in the implementation of Positive Behavior Interventions and Supports, the Zero Suicide initiative, and Trauma Systems Therapy among many other vital programs at KVC Prairie Ridge Hospital. With extensive experience in staff supervision, treatment, and client care, Astra has been an integral part of the growth of KVC Hospitals, which serves thousands of children, adolescents and adults each year. Astra is known for her dedication to customer service and creativity in ensuring that each family served has a great experience. Her professional interests include employee engagement and retention, multicultural issues in counseling and suicide prevention. Astra completed her master’s in counseling and guidance with an emphasis in mental health at the University of Missouri-Kansas City. She also serves as an Intensive Care Nursery Parent Volunteer at Children’s Mercy Hospital, is a member of the National Board of Certified Counselors, a member of the Association for Play Therapy and the American Association of Suicidology, and has presented locally and nationally on Effective Short-term Residential Treatment, Suicide Prevention, Trauma Informed Care, Brain Science and Resiliency.